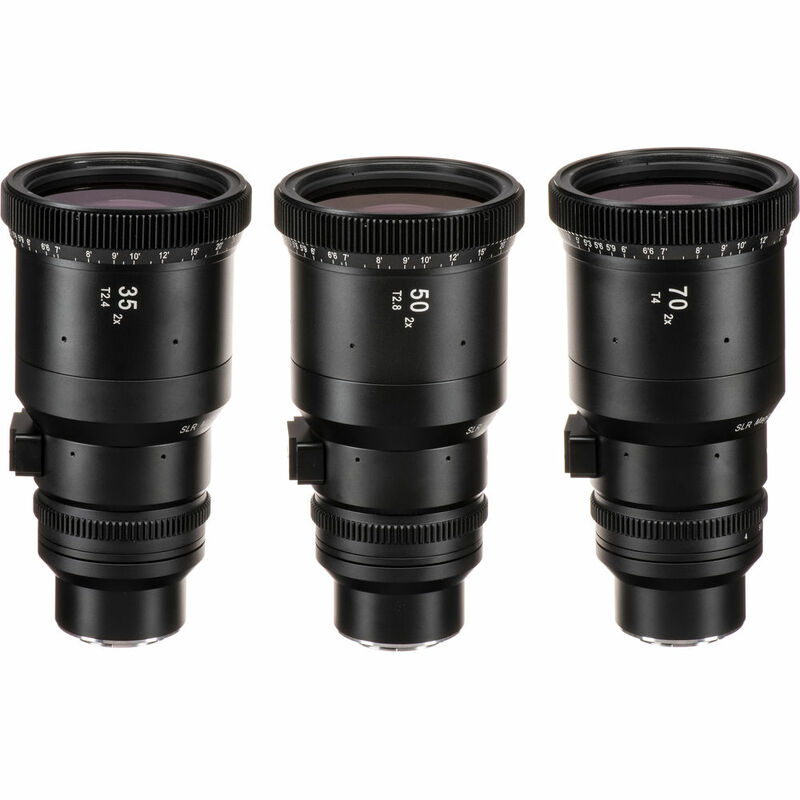 This set of anamporphic prime lenses from SLR Magic includes a 35, 50, and 70mm lens. The lenses provide a 2x horizontal squeeze, which creates a 2.66:1 aspect ratio on a 4:3 sensor. The lenses feature an MFT mount and are suitable for use on cameras with a Four Thirds-sized sensor. The lenses feature geared focus and iris rings, with a rotating front, which makes it unwise to use a clip-on matte box as that will also rotate with the front of the lens. The 82mm front filter thread allows you to screw in filters, such as diopters to shorten the 3.5' minimum focus distance. Each lens in the set comes with a hard case for storage and transport. Box Dimensions (LxWxH) 18.4 x 15.7 x 7.9"
What is the T-stop on these lens? CINE 35mm offers a maximum of T2.4. CINE 50mm offers a maximum of T2.8. CINE 70mm offers a maximum of T4. what is the field of view on the three lens? A 2x anamorphic lens doubles the horizontal field of view of the taking lens. Therefore on a MFT camera in 4:3 mode, a 35mm anamorphic lens will have the same filed of view as a 17.5mm or 52.61. A 50mm will be the same as a 25mm or 38.17. The 70mm will be the same as a 35mm or 27.76. Could I use these lenses on a ursa mini 4.6k? since anamorphic mode crops in the sensor to a 4x3 3k. Granted I know I would need an adapter for the lens.. Sorry, these lenses cannot be made to work on an URSA Mini. For these lenses to work, we suggest a Panasonic GH4. If you wish anamorphic in Super35, you could use a PL Mount URSA Mini with SLR Magic 1.33x Anamorphot-CINE Lens Set with 35, 50, 70mm Lenses (PL Mount) B&amp;H # SLRAC133PLST. Step down rings are generally not the best way to go. You do chance vignetting as well as cutting light and affecting your exposure. In the long run, it is better to do it the right way. You will thank yourself. Is a 70mm equivalence on MFT (35mm) seriously the widest you can get??? Or are these labeled true, as in, shooting 35 with a 35 MFT will get me 35? If you put a 2x 70mm slr magic anamorphic lens on a gh5, the field of view ( the width ) will be like if you put a 35mm regulare spherical lens. Will these lenses work with the GH-5 shooting in it's 4x3 option mode? Yes, that is a specific intent of the GH-5 and the SLR Anamorphots that they can work together. These lenses will mount on the Panasonic G7 and create an image. We would however, recommend a higher level camera like the Panasonic GH5 to better take advantage of what these lenses can do. What people are confused about is that a 2x anamorphic doubles the field of view. This effectively cancels out the 2x crop of the GH5 such that a 35mm lens is now actually 35mm equivalent... to a 35mm lens on a full-frame camera. Heres the simple answer: These lenses (SLR Magic 2x anamorphic) on Micro Four Thirds are 35mm, 50mm, and 70mm in Full Frame terms. Basically a perfect set to shoot most cinematic imagery, though personally I would also like to add in a 100mm. Hope this helped.